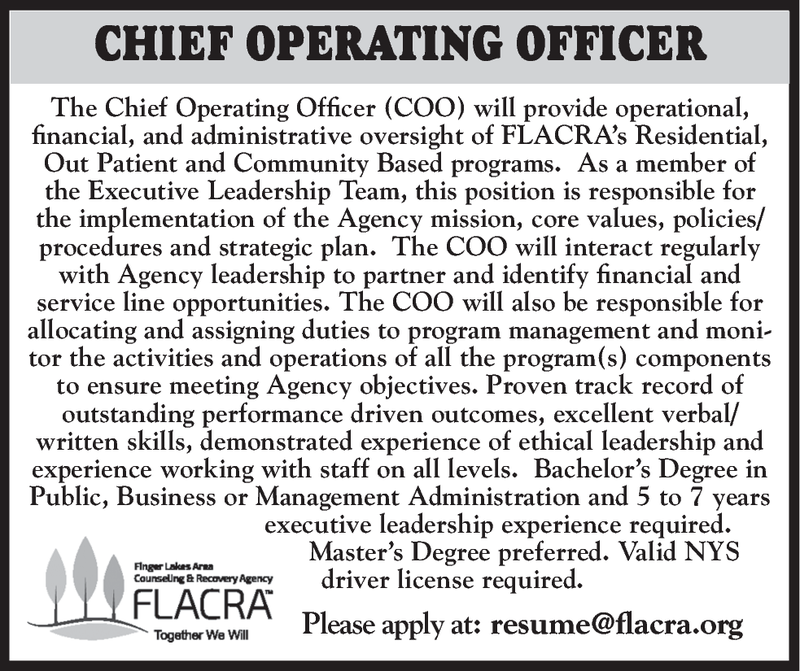 The Chief Operating Officer (COO) will provide operational, financial, and administrative oversight of FLACRA’s Residential, Out Patient and Community Based programs. As a member of the Executive Leadership Team, this position is responsible for the implementation of the Agency mission, core values, policies/procedures and strategic plan. The COO will interact regularly with Agency leadership to partner and identify financial and service line opportunities. The COO will also be responsible for allocating and assigning duties to program management and monitor the activities and operations of all the program(s) components to ensure meeting Agency objectives. Proven track record of outstanding performance driven outcomes, excellent verbal/written skills, demonstrated experience of ethical leadership and experience working with staff on all levels. Bachelor’s Degree in Public, Business or Management Administration and 5 to 7 years executive leadership experience required. Master’s Degree preferred. Valid NYS driver license required.